Stay awhile and see what I can do for you. Design and they will come, just doesn't work. 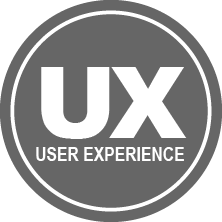 Building online experiences through user driven methods. With a population of almost 50,000, Downers Grove is twenty-two miles west of Chicago. 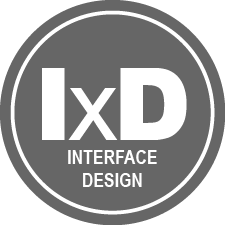 UX professional with over 20 years of web development, product management, and visual design experience, all with a strong knowledge and utilization of accessibility. 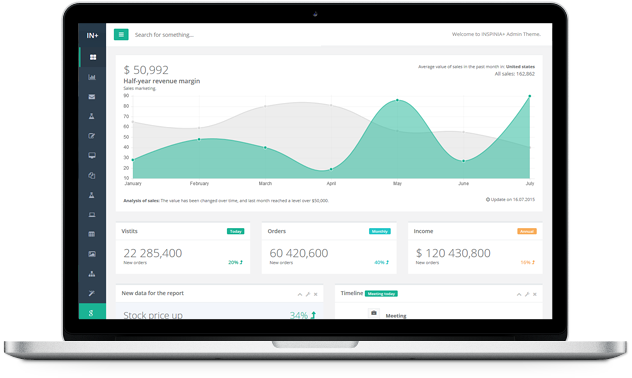 A SaaS company with strong concentrations in G2G solutions based on Human Resource practices and performance for online wage and benefit management. 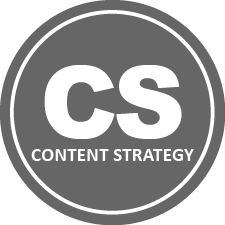 Taxonomy, CMS Systems, Information Architecture, Content, and Governance. Customer Journey Mapping, Task Flow & Needs Analysis, Feature & Functionality, and Interface Design. 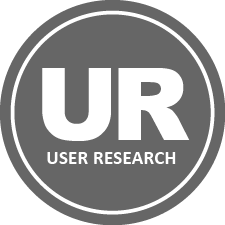 Ethnography, Findings Analysis, Personas, Trends, Opportunity Landscape, and Usability Test. 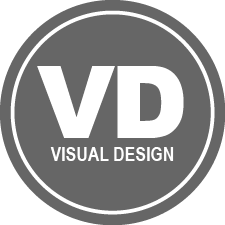 Digital design, storyboards & narratives, and visual concepting. An assortment of high quality projects that I have recently completed. 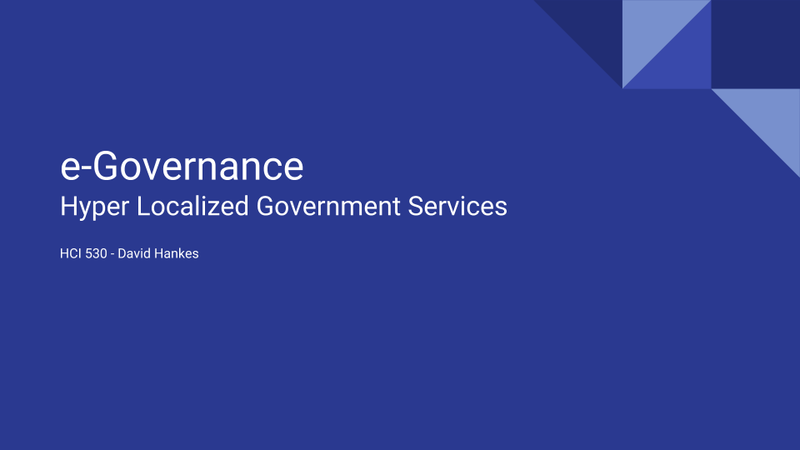 Electronic governance is the information gateway for delivering and communicating government services through public websites. Today, 56.7 million individuals in the United States and more than 550 million worldwide who have some form of disability, navigate and process these e-governance solutions differently. 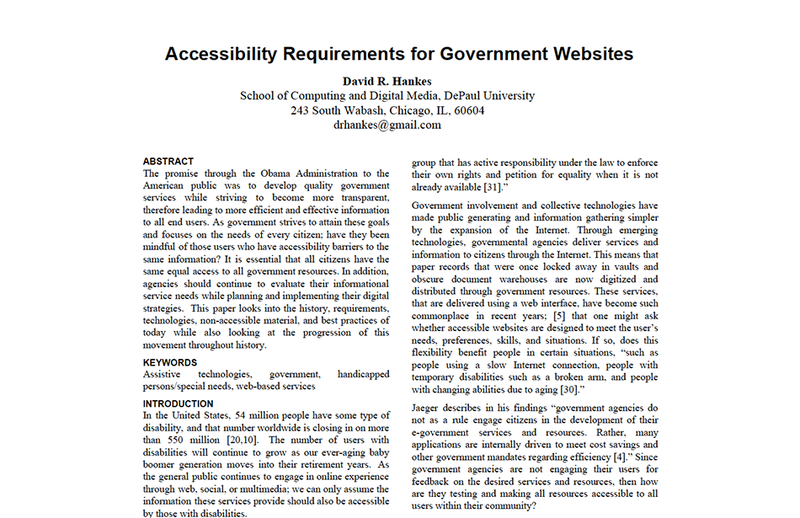 Past research regarding government website accessibility has long been focused on evaluations, content analysis, web accessibility guidelines, and tools for testing accessibility. 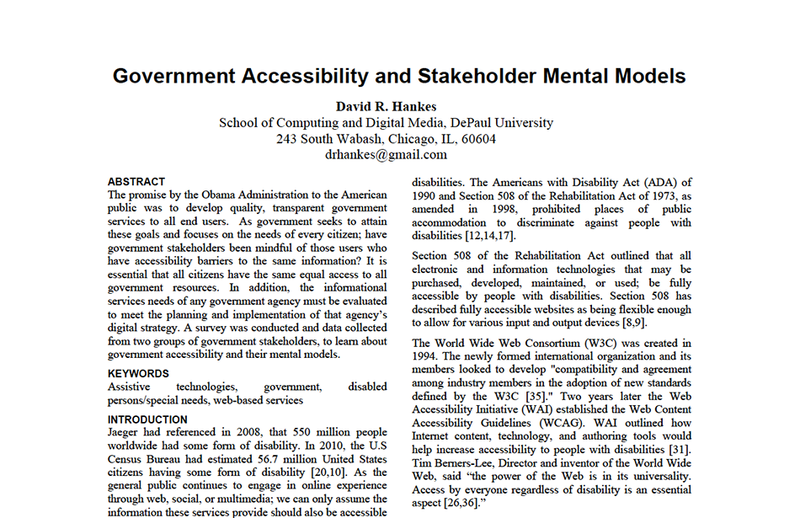 In each of these studies, research has looked at the post production of a live website, but very few has examined the mental model of accessibility of stakeholders and content creators. The promise through the Obama Administration to the American public was to develop quality government services while striving to become more transparent, therefore leading to more efficient and effective information to all end users. As government strives to attain these goals and focuses on the needs of every citizen; have they been mindful of those users who have accessibility barriers to the same information? It is essential that all citizens have the same equal access to all government resources. In addition, agencies should continue to evaluate their informational service needs while planning and implementing their digital strategies. This paper looks into the history, requirements, technologies, non-accessible material, and best practices of today while also looking at the progression of this movement throughout history. 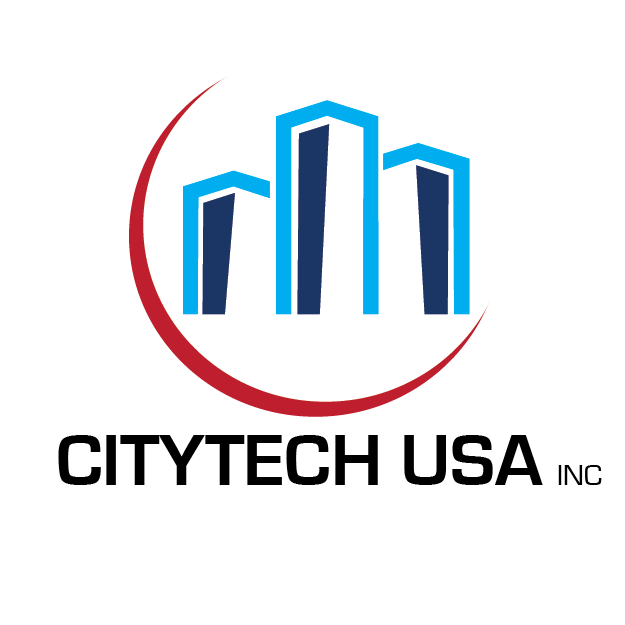 Government websites and e-government are the information gateway for many city, county and state taxpayers. Agencies around the globe make information available, provide forms for electronic filing, give their patrons a digital place to perform transactions and read the viewpoints of their governing bodies. For many, it is simply typing a few characters into a search box and within a couple clicks they have all their information. Do all visitors have the same access? For the 56.7 million individuals in the United States and more than 550 million worldwide [Rutter, 2006] who have some form of disability, these procedures of getting the same information are not so simple. 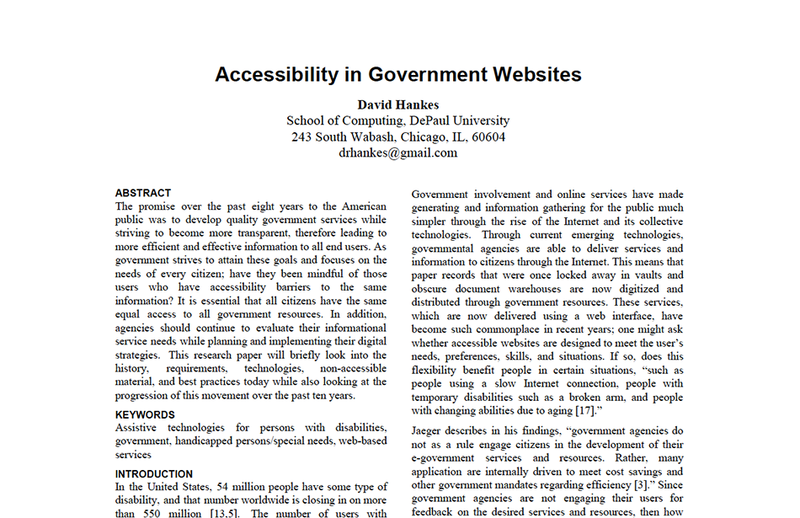 This study will look at the informational accessibility from a local government level and how to make this transparent information more available. 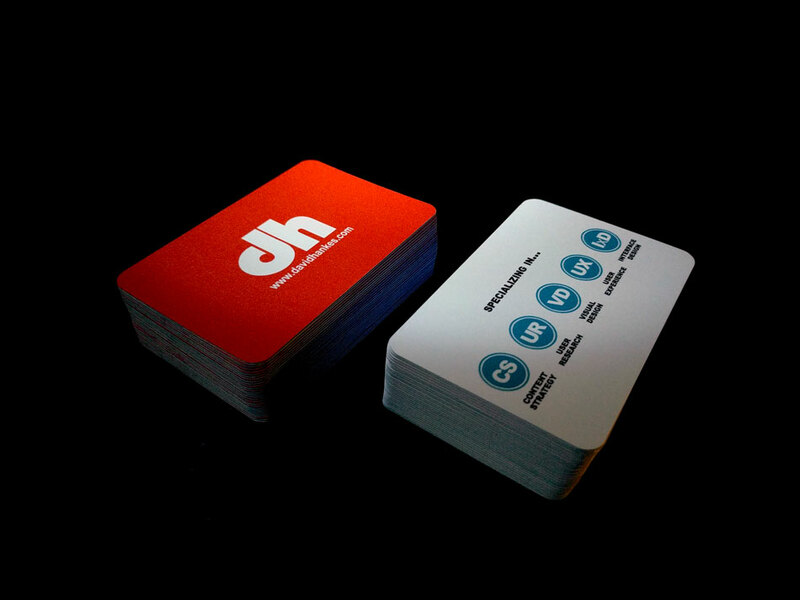 Utilizing the information from group feedback and the style tiles project, I proceded to create a brand identity to formulate and design business cards. Creating a font based logo utilizing my initials on the front with the primary color from the style tiles and following up with the website URL under to direct people where to get further information. On the reverse side, I decided to pull the polar chart sections on the website and reiterate them on the back of the business card to create continuity with the website. This project created style tiles for a personal portfolio which helps the design deliverables of fonts, colors and interface elements communicate the overall visual brand for a project. Style tiles allow the design and its corresponding elements communicate the information to the client or stakeholders and provides a catalyst for further discussion. Using the Five Hat Racks process, I researched the history of barbeque and how it came to be throughout the world until present day. I took the data collected and applied the L.A.T.C.H (Locatiom, Alpha, Time, Category, and Hierarchy) methodology to produce a final categorical infographic. 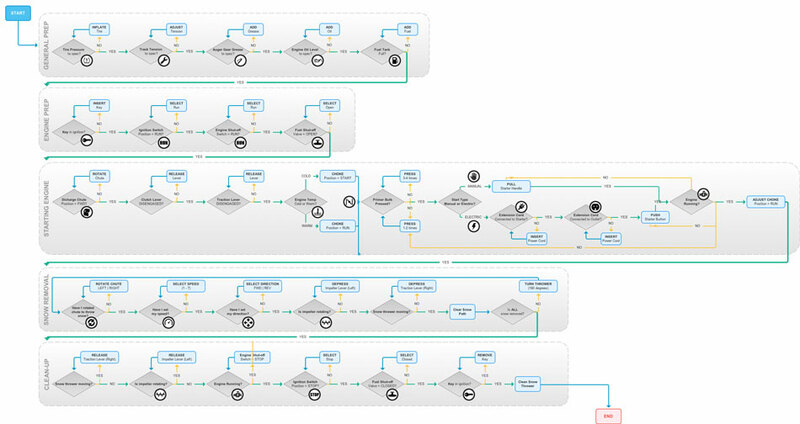 The task was to diagram the process flow of a game, process, or single user interaction which achieves a specific goal. I chose the process of using a snow thrower during a snow storm. 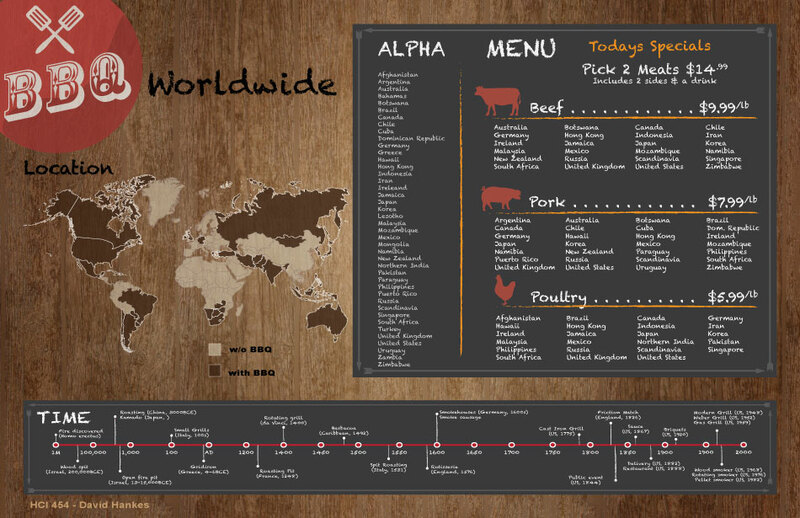 The end project entailed creating all the graphics and diagraming the process in detail utilizing Axure. The group project was detailing an idea of making the user experience at the Rock and Roll Hall of Fame better, utilizing all of the digital media and technology the museum has on site. 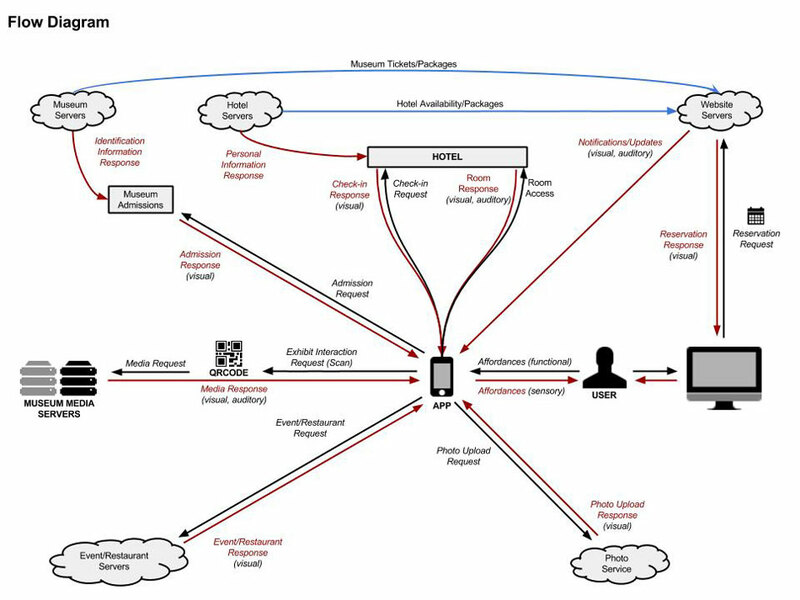 This Flow diagram shows how the mobile application would allow a user to "tour like a rock star" and experience a museum tour like no other. 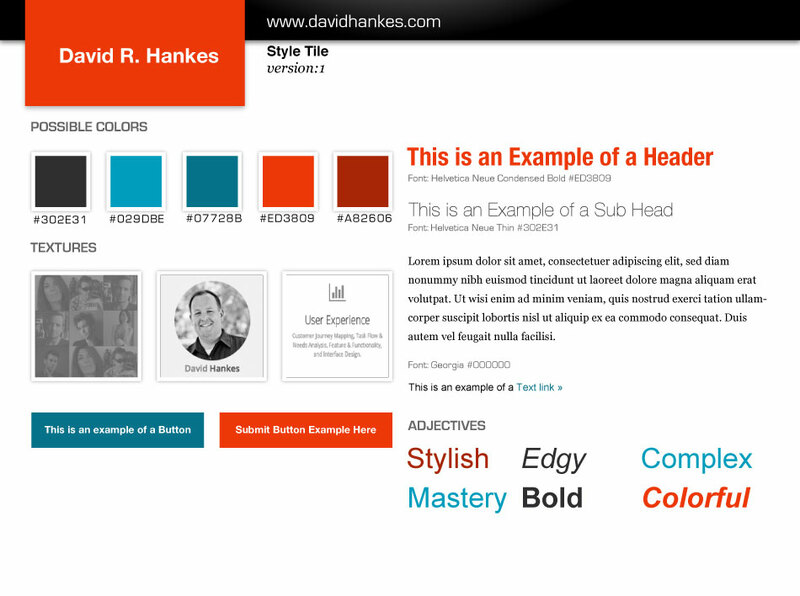 "Dave is a very thorough and passionate designer. His attention to detail and strict adherence to web standards make him a real joy to work with. He is constantly learning new technologies and ways of doing things to make both his own job and his colleagues' jobs easier and more productive." "David is technically very savvy. He is also very easy to work with and is always open to suggestions. He is very thorough, carefully considering different options before making decisions." "David has an excellent grasp of the technical details of his job ... with the ability to work with people with no technical expertise. He is a tremendous asset to the organization and to his department." "Dave was a tremendous asset to myself and the Village. Prior to becoming Village Manager, Dave was a great asset to me as the Police Chief."